Two of Trent University’s brightest young alumni were honoured at a special luncheon hosted by Trent President Leo Groarke on Tuesday, August 22, at Alumni House, which brought together Peterborough-based alumni from across five decades of Trent history to celebrate the impact of Trent alumni on the Peterborough community. 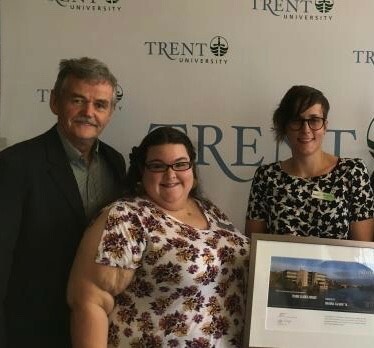 At the event, which aimed to spark discourse on continued alumni involvement in the Peterborough region, the 2017 Trent University Alumni Association Young Alumni Leader Award winners were also celebrated. Among them, Brianna Salmon, executive director of GreenUP was recognized for their leadership and accomplishments. For the first time ever, the 2017 Alumni Awards at Trent are being presented over multiple ceremonies. While the Young Alumni Leader Awards were handed out at the Trent University Symons Campus, other 2017 awards will be presented to honourees in their own communities across Canada. It is expected that future Alumni Awards, honouring international graduates, will be delivered at events around the world. This new format will allow even more alumni to be involved in recognizing Trent’s outstanding graduates. Whether through their volunteer activities or their career choices, each of this year’s Alumni Award recipients have generously devoted their time, energy, and skills to serving both Trent University and the broader communities in which they live. a Peterborough Project (also part of Phase I CFICE). Most recently, Brianna Salmon has been a key driver behind a multi-sector coordinating committee’s application to have the Peterborough-Kawartha-Haliburton region recognized as a UNESCO Regional Centre of Excellence in Sustainability Education.